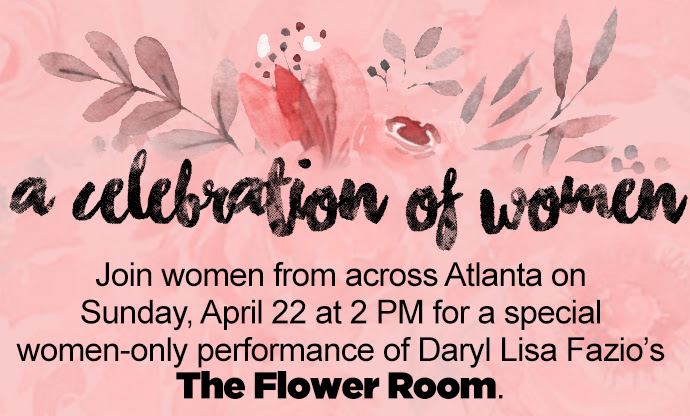 In celebration of Daryl Lisa Fazio's daring world premiere about sexual discovery and female empowerment, Actor’s Express invites you to a special women’s only performance of The Flower Room on Sunday, April 22 at 2 PM. Women attending this private event will enjoy complimentary champagne and dessert while watching a performance of this hilarious new play that celebrates a woman’s ownership of her body and sexuality. After the show, guests will be invited to stay for a panel discussion focused on the #MeToo Movement and led by three remarkable women: AE Board Member Stephanie Davis, Kwajelyn Jackson of the Feminist Women’s Health Center, and The Flower Room playwright Daryl Lisa Fazio. Please join these fearless women as a supporter of Atlanta's most exciting theatre. $50 single tickets are available online now, or e-mail Managing Director Alex Scollon to learn about joining the host committee. Tickets for all performances are on sale now! Call the Box Office at 404-607-SHOW (7469) Tuesday through Friday between 12 and 5 PM.